Carrie Houston joined the Institute’s staff in the summer of 2013. Carrie holds a Bachelor Degree in Mechanical Engineering from Dalhousie University in Halifax, Nova Scotia and a Masters of Science in Renewable Energy from Murdoch University in Perth, Australia. Carrie has past experience in working with large industrial equipment O&M in the energy industry, as well as, project management of structural and civil construction projects, sustainable community design, and climate research. Carrie has been a member of Engineers PEI since 2006 and was a member of the Association of Professional Engineers and Geoscientists of Alberta prior to 2006. 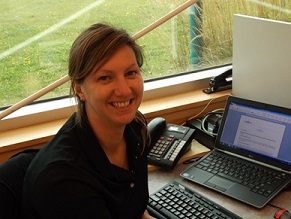 Carrie is involved in overseeing operations of the Institute’s North Cape site and the Wind R&D Park in Norway, PE with a focus on facilitating research collaborations using the Institute’s infrastructure, location, and resources. Carrie, a native of Prince Edward Island, has held a keen interest in renewable energy since beginning her engineering career and is pleased to be involved in the advancement of wind energy in Canada. Carrie lives in Summerside with her husband, Stephen.